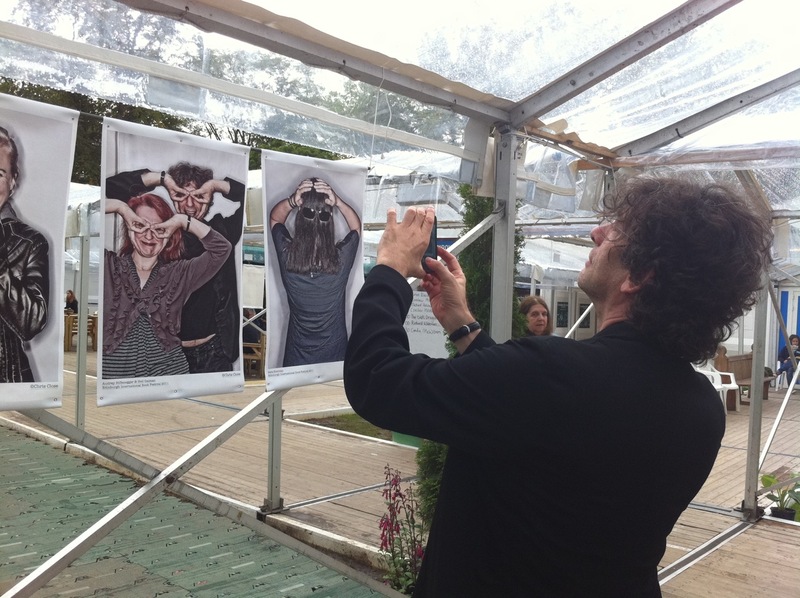 On Day 6, I took a picture of Neil Gaiman taking a picture of a picture of Neil Gaiman. It would all have been perfect if only I’d managed to go back in time and take a picture of me taking a picture of Neil taking a picture of himself. 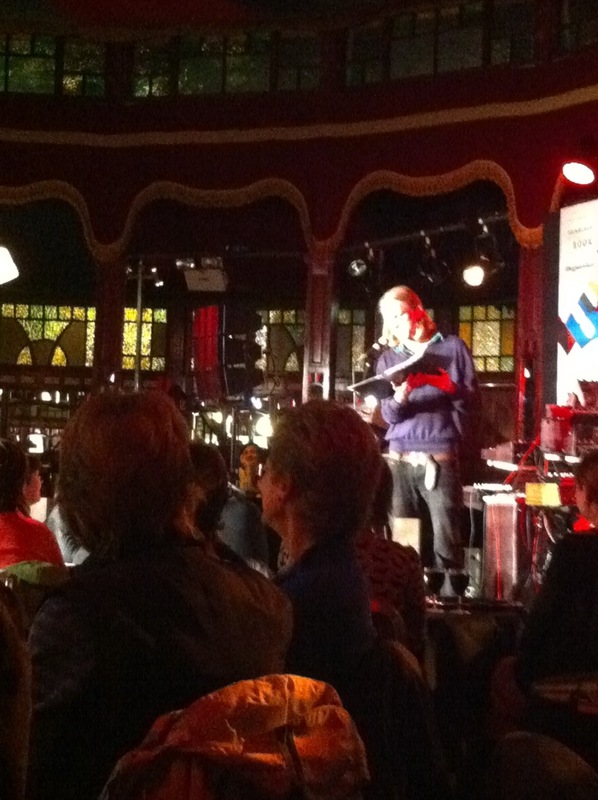 Or if literary paparazzo and official Book Fest snapper Chris Scott had caught the moment on camera. 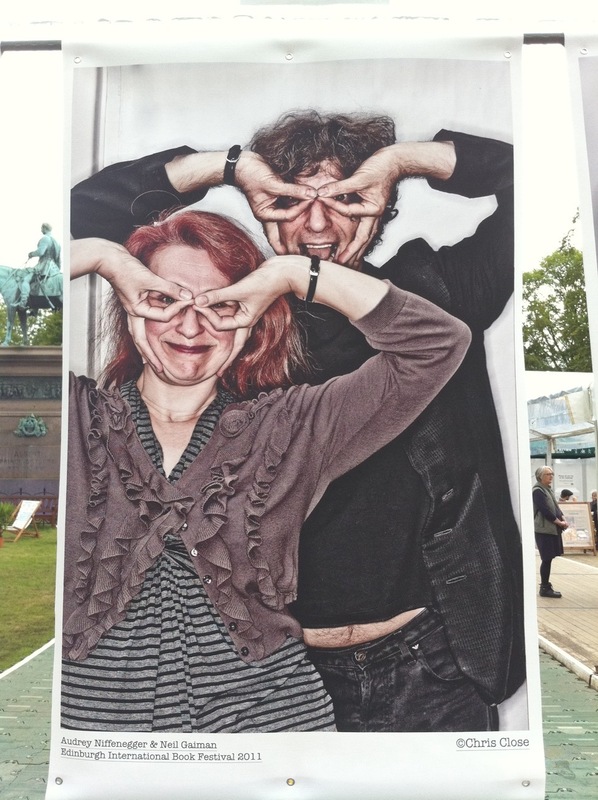 Neil was taking a snap of a portrait of him with Audrey Niffenegger, taken as part of photographer Chris Close’s exhibition of authors that line the walkways at the Book Fest. He was back at Charlotte Square to take part in one of the Amnesty International 50th anniversary events. 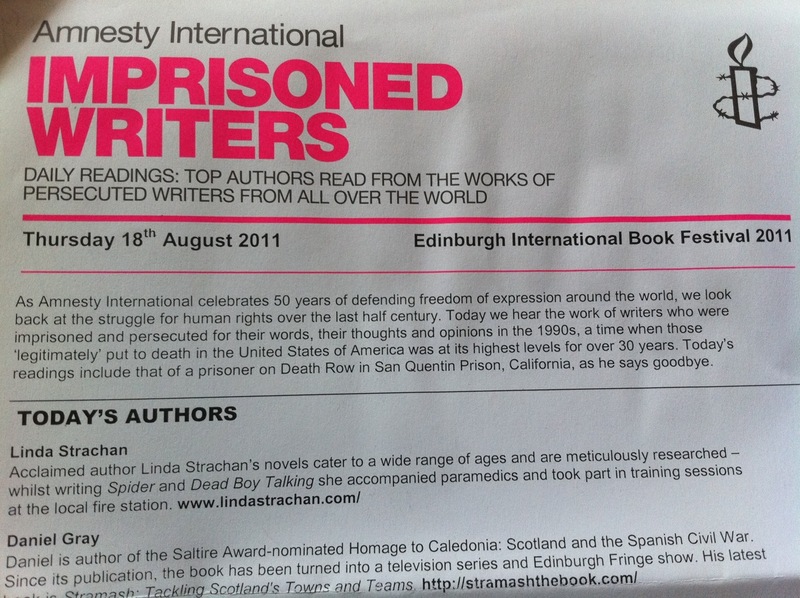 Each year, Amnesty runs a series of daily readings at the Book Fest, with top authors reading from the works of persecuted writers from around the world. The readings are illuminating and essential, reminding us of those who do not have the freedom to express their views or challenge authority. Linda Strachan read the work of Nigerian writer Ken Saro-Wiwa, executed after a rigged trial – one of his friends was in the audience. Daniel Gray read from Peru’s Yehude Simon, imprisoned on false terrorism charges, who told us ‘the darkness shall not triumph over the light.’ Neil Gaiman talked about the death penalty (‘the ultimate cruel and inhuman penalty‘) as he read us the words of Death Row inmate Glenn Cornwell. Dictators aim ‘to cage the nightingales‘, said poet Michael Longley, who gave a tender reading from Burmese opposition campaigner Ma Thida, a woman imprisoned for 20 years for her writing. The reading, about saving the life of a child with a father in the ruling regime, moved many to tears, but the overall message from Amnesty’s Siobhan Reardon was one of hope – that we can and must support those voices that others seek to silence. The Kelpies Prize is awarded by Floris Books each year to an unpublished story – the winner receives £2,000 prize money and has their book published as part of the Kelpies imprint. Congratulations to winner Alette Willis, whose book will be published in November. The night’s Unbound series was hosted by Ryan van Winkle and the Golden Hour, with an excellent audience-participation story from Joe Dunthorpe. Like those children’s books where you make a decision (eat the green olive or eat the black olive?) and the story takes a different turn with every choice made. The day was grey, and so were my shoes, snapped here on my way into the Kelpies Prize by Story Shop author Helen Jackson. You should read her story.